I apologize for the lack of posts lately, this summer has gotten busy and I’ve fallen behind a bit. But I promise to catch up this week and I have some great recipes to share! I have to admit, I’m not a fan of rhubarb. But when a friend handed me an armful of green and red stalks from her garden few weeks ago, I knew it would be a great opportunity to share more recipes from the box. Aside from all the learning experiences in the kitchen and eating great food, sharing the recipes with friends and family is one of my favorite parts of this project. I knew that all that rhubarb would go a long way, especially since I don’t eat it. I chose to start with the Popular Rhubarb Cake and the Rhubarb Dessert. The first step was to clean and chop up the rhubarb. I quickly learned that not only do I not like the taste of those Christmas-colored stalks, but I also don’t care for the smell. I cut up the amount I needed for both recipes as fast as I could and moved onto the next step, which smelled much better: the batter. The cake reminds me of a coffee cake or a breakfast crumb cake and smells quite similar while baking. The cinnamon masks the odor of the rhubarb very well. Once it was removed from the oven and cut into pieces, aside from the bits of red coloring dotted throughout the cake, you’d really never know the rhubarb was in there. I was even brave enough to try a bite and was pleasantly surprised at how delicious it was. 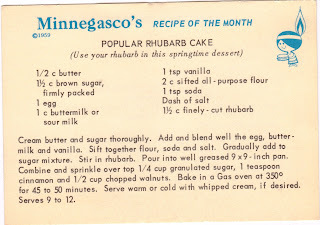 I’d try making it again, but instead of rhubarb, I think I’d substitute for strawberries or blueberries. The dessert won me over as soon as I realized that the bottom layer is shortbread. I love shortbread. And this recipe is also very easy to make and doesn’t take much time at all once the rhubarb has been finely chopped. I had to try a bite of this one as well and was again surprised at how good it was. The shortbread definitely helped and I think the combination of flavors complimented each other well and as a result, the rhubarb wasn’t overpowering. 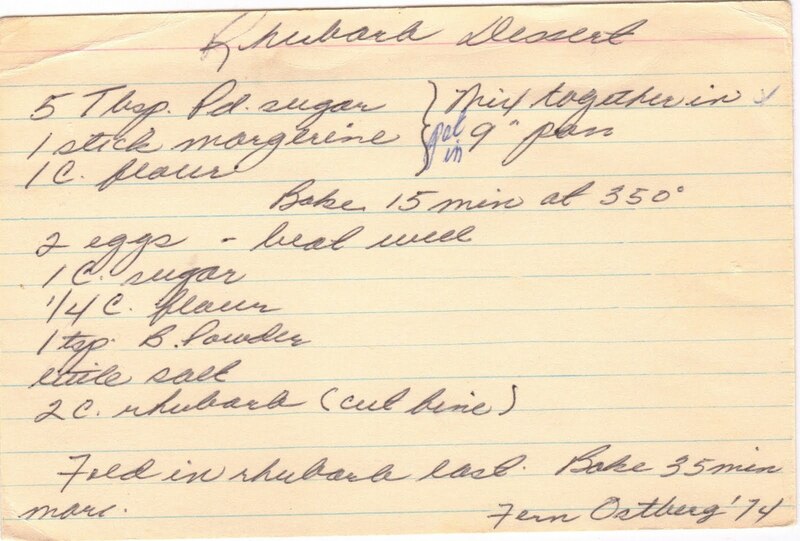 I believe you could also make substitutions for the rhubarb in this recipe. One of my favorite things to put with shortbread is raspberries so I may be trying this again sometime during the summer before they go out of season. Although these two desserts aren’t large, I was able to share them on three different occasions. They went to my poetry group, to our neighbors (the ones Murphy delivered a birthday cake to) who love rhubarb, and they also made a trip down to Illinois to my family. 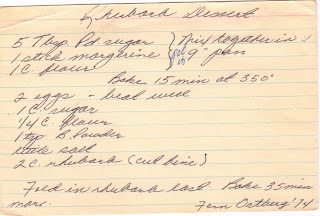 I took the rest of the rhubarb stalks with me on that trip and had planned to make a shortcake recipe, but the weekend went by way too fast and was over before I knew it. I never made the shortcake and on the drive back to Minnesota, I realized I had forgotten the rest of the stalks at my parents’ house. Maybe, subconsciously, I left them there on purpose. I think I needed a break from rhubarb. But I told my parents to share them with anyone they know who loves the smelly stalks so hopefully they went to good use. 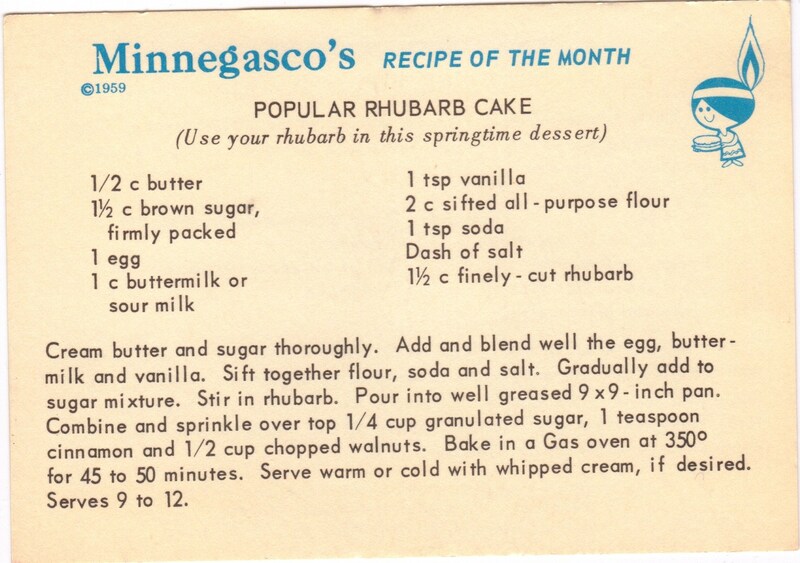 I’ll have to save the shortcake recipe for the next time someone needs to purge excess rhubarb from their garden. I can't believe Murphy will just stare at food. Dorie has lost her whole house privileges due to consuming an entire loaf of bread. She is old so maybe forgetting her manners :) At least she didn't bloat!